Rose Tyler is the new companion (played by Billie Piper). She's different from all of her forerunners. She has a job, boyfriend and family whom we see in more than just the first episode, and has to come to terms with her new time-and-spacehopping life having an effect on her old existence. Rose sees how events affect individuals rather than an entire planet, and sometimes has more insight into human reactions than the Doctor understands. The Doctor's spaceship, the Tardis (Time And Relative Dimensions In Space), still looks like a London police box, much to Rose's bewilderment, since she's never seen one. On the inside, designer Ed Thomas wanted to make it look as if the Doctor has been changing bits since the viewer last met him. The result is one of the most impressive bits of organic-looking hi-tech ever on TV, with just the right air of "bit of a mess" to make it unique — not just another shiny spaceship. The Daleks, the best-known monsters from Doctor Who, will be returning later in the series. In the meantime the Doctor and Rose will face the revived Autons — animated shop window dummies and other plastic creations that first terrified young viewers in 1970 — and entirely new creatures like the tragic Gelth, or the apparently fun-loving Slitheen. These aren't hokey men in suits — the new creations look and feel like the real deal. Saturdays will never be the same again! APA 6th ed. : Clapperton, Guy (2005-03-12). Who's who?. Radio Times p. 16. MLA 7th ed. : Clapperton, Guy. "Who's who?." Radio Times [add city] 2005-03-12, 16. Print. Turabian: Clapperton, Guy. "Who's who?." 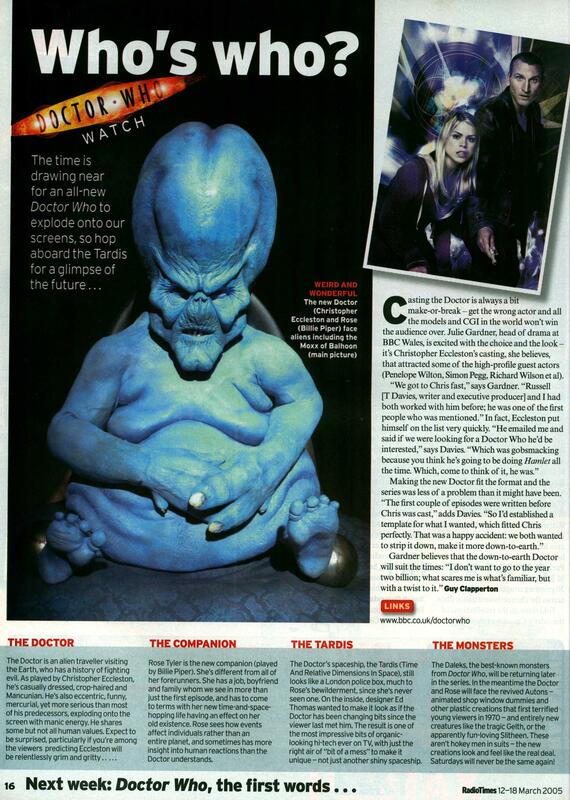 Radio Times, 2005-03-12, section, 16 edition. This page was last modified on 21 December 2013, at 00:51.